The 2018 hop harvest is less than 60 days away! We are looking forward to another bountiful season and hope you are, too. According to the USDA-NASS hop acreage report, the U.S. hop crop is forecasted to increase to 55,339 acres – up 4% from last year’s 53,282 acres. Growth Status: Overall, the crops are developing nicely. Early bloom has been detected in some varieties. Cascade, Centennial, and Simcoe have seemingly been impacted the most, but there is nothing to be greatly concerned about. Mildew and aphid/mite pressure is under control and temperatures are forecasted to rise into the 80s and 90s for the next few weeks. At this time, all looks well – especially in late high alpha varieties. 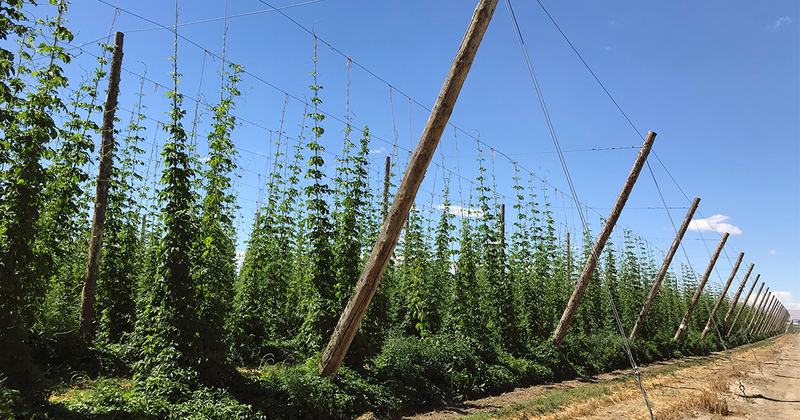 Hopsteiner Farm Updates: This year, harvest production is predicted to be more efficient and successful, thanks to the technological and process changes recently made at the Hopsteiner hop ranches. In order to build better scouting reports and more accurate protection treatments for hop crops, new software for plant data and plant protection application was implemented for the 2018 season. New sensors have been strategically placed in the yards to collect samples, harvest plant data, and arrange for better fertility and for benchmarking plant figures. Hopsteiner also made several important infrastructural investments this past year. Updates to hop combines, new conditioning warehouses, and a new drying kiln has been added to Hopsteiner’s Mabton Ranch. New loading and unloading bins and conveyors, previously installed at River Ranch, have now been added to the Roza and Emerald farms for “hands-free” output. Infrastructural investments ensure even higher quality processing of our hops by helping keep those precious lupulin glands intact. The ever-growing popularity of aroma-heavy beers in the craft market seems to be driving demand for heavy flavored hops. Through the success of Hopsteiner’s breeding program, we can offer uniquely flavorful and aromatic hops with attributes that push the boundaries on disease-resistance, aroma/bitter components, and crop yields. Lemondrop™ – A Rising Star: One of our newest and most popular hop varieties, Lemondrop™, is another citrus-forward variety available in leaf, pellet, and oil form. This popular hop offers a unique lemon-citrus character with a pleasant aroma. The bright citrus and subtle herbaceous notes are perfect for sessionable beers. While ales tend to bring out its sweeter side, Lemondrop™ is delicate and refined enough for quality pilsners and light lagers. All planting and farming is done sustainably, with the environment always in mind. Hopsteiner has recently been accepted as a member of the Sustainable Agriculture Initiative (SAI) Platform and is GLOBALG.A.P. certified, thus meeting the worldwide standard for good agricultural practices. To see the complete 2018 acreage report, please click here. See the list of all hop varieties available through Hopsteiner here. Additional hop varieties and hop products can be found on Hopsteiner’s Portal, where orders can be placed directly online.